After the needlessly hyped and “controversial” events of Justice League #12 we return to witness the fallout as The Cheetah makes her debut. For such an event that was embarrassingly showered with media coverage, what exactly was the aftermath? More importantly, what else did this issue have to offer? 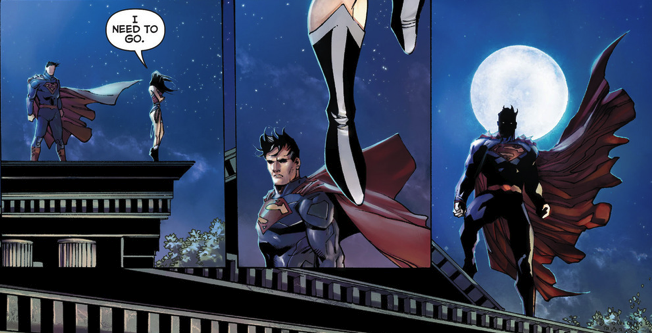 First of all, even though DC seemed to be going out of its way to hype up the Superman/Wonder Woman kiss and what would presumably be a future relationship, it stalls right out of the gate. Something that was being lauded as “important” just whimpers in its continuation as Superman and Wonder woman decide to not pursue it further, yet. On one hand this is a good thing, since it’s not such an immediate thing and can at least build up some of that nonexistent “flirty foreshadowing” that writer Geoff Johns was describing. The problem is that, again, it falls short of what was being sold to readers two months ago and for such a big stir that it caused among readers it just falls flat. Other than that the issue was surprisingly passable, perhaps even decent. Unlike plenty of the earlier issues there are moments where the characters actually act like a team, something that has been missing from this team book. The reintroduction to The Cheetah wasn’t so badly done and the effort put into making her a Justice League-level threat was at least put in, even if it was a bit somewhat sloppy. Her abilities have been raised a considerable degree so that opens the story up for some nice fights. 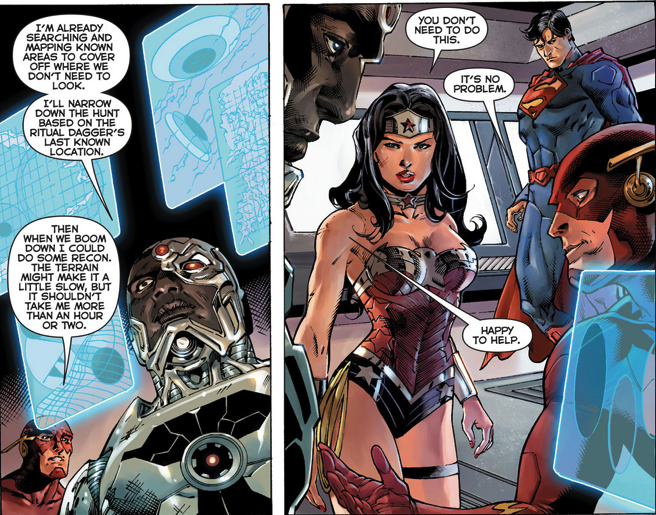 Another positive about this issue is Wonder Woman is finally given some solid character depth. There were hints of some in previous issues, but it was overshadowed by the myriad of problems that plagued those. Things are almost as messily handled in this issue but at least we get some decent character moments and dynamics with Diana. It’s something that the series has been sorely missing. There are still some really ridiculous moments and worrisome writing still abounds, the last page will have you laughing for the wrong reasons if you aren’t already shaking your head in disbelief, but this issue definitely seems like it’s a little step up from previous ones. There’s no Shazam! back-up this month, instead we are treated to one that features Steve Trevor, and co-written by Animal Man writer Jeff Lemire, which serves as build-up for next year’s Justice League of America. Both in the main feature, and in this back-up, Steve continues his reign as the most well-written character in Justice League. The little story did a good job at building anticipation for the upcoming title and was even able to bring back a plot point that was hinted at early on in the series but never followed up on. Does this look familiar? The art was also decent for the most part. Artist Tony Daniel made an effort for competency and it shows. There are still several moments where it can see seen that he stretched himself and the art decreases a fair margin. While there are even scenes where the characters are off model it is on the whole not that big of a problem. Overall this issue was decent by Justice League standards, but only just a little bit above stagnant on it’s own.